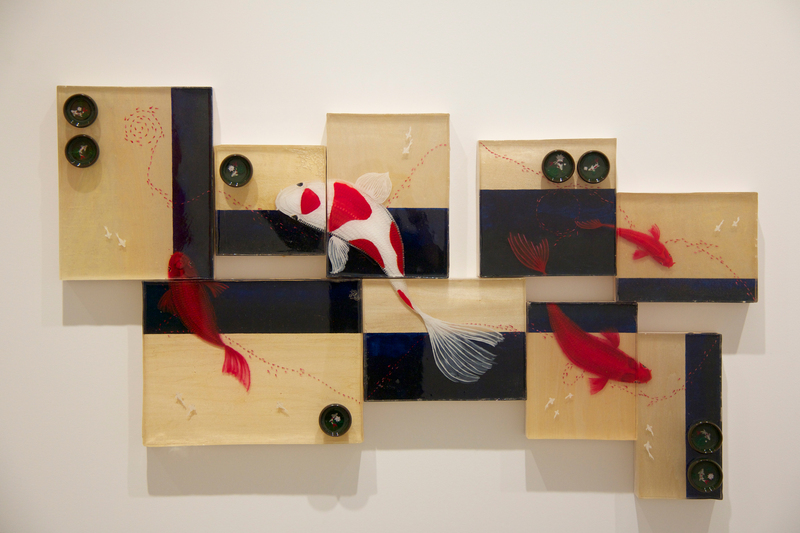 Shidan Xiao's "Keep a Beginner's Heart," a mixed media composition on wood panels, is part of the MFA Thesis Exhibit at the Steinberg Museum of Art. Five talented young artists with distinctly different styles all share something in common: Their graduate work is currently on display in the Steinberg Museum of Art as part of the LIU Post M.F.A. Thesis Exhibition for 2018, now through May 11. Under the theme “Veritas” (which means “truth” in Latin), the exhibit showcases the audacious creativity of Hyon Hee Cho Hartberger, Meiyao Che (Phyllis), Laura Helen Sweeney, Shidan Xiao (Joselyn) and Xiaohui Xiao (Emily). Seung Lee, director of Fine Arts and Graduate Studies at LIU Post, is rightly proud of their accomplishments here. Hyon Hee Cho Hartberger, born in South Korea, has been active in the Korean art community for three decades. She was given the title of Master Artist in 2016 before coming to the United States. Her autobiographical style evolved from traditional Korean art and calligraphy to incorporate brush strokes and layers of texture epitomized by modern expressionism. Meiyao Che (Phyllis), a Chinese graphic designer, makes her unique characters come to life through her mastery of a colorful palette thanks to her command of spray paint and her own illustrative power. When she’s not working on a canvas, she does pottery, printmaking and graphic design. “Exaggerated movements and characters are what I do best,” Che wrote in her statement. Born in Shanghai, Shidan Xiao (Joselyn) has found a compelling way to combine flowers and koi fish in her work shown here. The koi seem to swim through water thanks to her careful layering of delicate brushwork in acrylic paint and coats of glossy resin that add depth to her creations. “Through this painting I want to convey the idea that no matter what difficulties we encounter on the road through life, our initial heart should not change,” she wrote in her statement. A graphic artist from China, Xiaohui Xiao (Emily) uses ceramics and digital art in her work while playing with two-dimensional and three-dimensional space to render her Chinese zodiac symbol, the horse, in many guises. The exhibit is free and open to the public. Museum hours are 9:30 a.m. to 4:30 a.m., Monday through Friday, and 11 a.m. to 3 p.m. on Saturday. For more information, call 516-299-4073 or go to liu.edu/museum.